The American Optometric Association states that after the age of 40, presbyopia is the most common eye condition adults develop, meaning they have trouble focusing on something at a short distance, like a book or newspaper. This is a result of the eye lens becoming less flexible, and this condition may advance with age. While it is true that age 40 and beyond might require the use bifocals or people may experience some changes in night vision, there are many nutrients in food and supplements that make it possible to maintain eye health and vision clarity despite experiencing some natural changes that occur with age. In addition to regular eye exams to rule out potential vision problems, there are other ways to make sure your eyes are nourished. This includes wearing sunglasses, using safety eyewear if needed, quitting smoking, and taking breaks from the phone or computer screen. 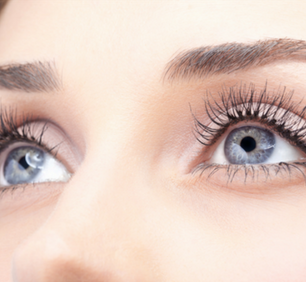 Vision can be nutritionally supported with food and supplements that directly target the eyes. Check out five of the top nutrients that benefit eye health. Beta carotene: Beta carotene is another carotenoid that is essential for healthy eyesight. * In the body, beta carotene converts into antioxidant Vitamin A and plays a role in night vision clarity. * Food sources of beta carotene include spinach, carrots, sweet potatoes, squash, pumpkin, and kale. Vitamin C: Most people associate Vitamin C with immune health, but this antioxidant plays an important role in eye health. * Vitamin C helps fight free radicals in the body that may reach the eyes, and it helps the body better absorb other vitamins and minerals. Vitamin C also assists with the formation of collagen, which is found in the cornea. * Food sources of Vitamin C include bell peppers, citrus fruits, and berries. Zeaxanthin: Like lutein, zeaxanthin plays a role in protecting the macula, which is positioned near the center of the retina. * Zeaxanthin cannot be produced by the body and needs to be consumed through food or supplements. Food sources of zeaxanthin include yellow vegetables, egg yolks, and leafy green vegetables.